One year after leaving The Vampire Diaries, Somerhalder is joining V-Wars, a vampire-themed drama based on Jonathan Maberry's novel series of the same name from comic book publisher IDW. 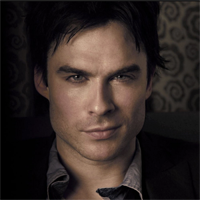 Somerhalder will star and direct the drama, which was given a straight-to-series order in 2014. According to Deadline, "Somerhalder will star as Dr. Luther Swann, who enters a world of untold horror when a mysterious disease transforms his best friend, Michael Fayne, into a murderous predator who feeds on other humans."